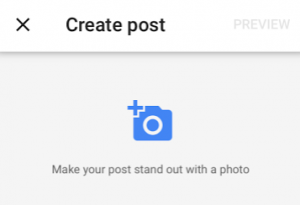 It’s been a month since first writing about Making Your Own Google Posts. According to Google Trends, this new feature has only taken off slightly at times. It’s slick, still relatively unknown and you can post up to 10 carousel posts to show up when folks search for your branded name, the first 2+ being visible upon the initial search. 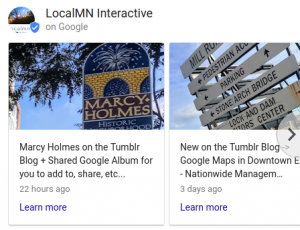 Google up “localmn” and you may see something like this. These posts show up when people do branded searches for you. They will most likely find you whether you did a speck of SEO or not. They recommend your posts be between 100 and 300 characters long, much less than a standard SEO just makes common sense to populate these posts with quality content for interested users. They do urge you to go with 200 or 300 words of content. Stick to 100 characters as that’s the amount of characters Google shows in the results. Again, people are doing a branded search. SEO is fine for this, although quality content for users can be perceived as better. 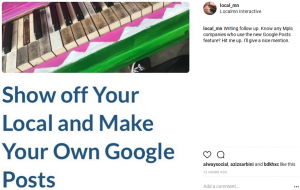 What Local Businesses Uses Google Posts? 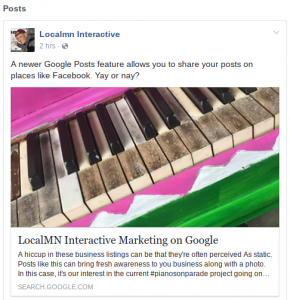 I literally couldn’t find a business in Minneapolis who currently uses the new Google Posts feature. So, I went to Twitter and Instagram. Got a few likes, but nothing. To me, this is still an up-tapped market. Google is always coming up with something new in their local division and it makes sense that this may currently be overlooked. Tap into it. 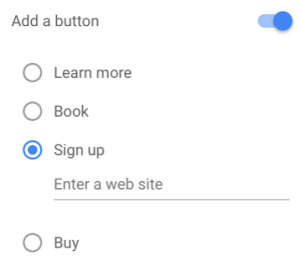 It’s free and it’s Google, and you don’t need to worry about setting up and maintaining a blog. 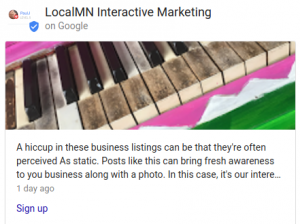 LocalMN Interactive provides Local Search Services including consulting for setting up and maintaining your Google Posts for a way to keep your customers well-updated and informed of what you have going on for them. Contact us of visit us on your social media channel of choice to learn more.